P28 pattern. Color: Multi. We apologize for this inconvenience. We are not an authorized dealer of this product and any warranty included with the product may not be honored by the manufacturer. Pickup hours. Selling 3 BRAND NEW Bauer 1X Lite, Brand New Full Custom Pro Stock Hockey Sticks. -Left-Handed -Kane P88 Curve -77 flex (haven't been cut down) -Full Tactile Grip plus Extra Grip -Beautiful custom blue graphics These sticks are still in the wrapping and have never been used. Would like to sell in bundle of 3, but am willing to negotiate. These custom Bauer sticks are about $350 if you order them online, and take 3 to 5 weeks to be delivered. I'm selling them for $200 each and will give you a deal if you buy all 3. The more you buy the cheaper they will be. Message me if you're interested or would like more pictures, thanks for looking. The Nexus N6000 features a proven traditional fused construction. Bauer uses a composite construction throughout the shaft made with a blend of carbon fiber and fiberglass. The square shaft shape with double-concave walls is preferred among pros and provides a nice secure grip no matter what shot you are taking. The Bauer Composite Stick, Senior (left handed) is a lightweight, high-performance stick. Quick Motion Shots: Low kick point stiff blade work together to optimize quick release shots. Quick Motion Shots: Low kick point stiff blade work together to optimize quick release shots. As you can see from the photos this stick is in great shape. It is a stick that was sent for Andreas Lilja but he never wound up using this stick. DETAILS ON THE STICK You will be receiving the exact item you see in the photos. Patterns: Custom Curves are very similar to one another. Shaft Texture: Grip. Curve: PM9. NOTE: Stick has been cut to the length for a 5'10"-6' person (to where the 92 flex line is indicated on the shaft). I cut the stick then realized I had bought the wrong blade, and now cant use it. Bauer Vapor 1X Aero Sense 2 Right Handed Hockey Stick. Shipped with USPS Priority Mail. We purchase recovered freight. All of it is new but some have been shuffled around a bit in transport and I believe that’s why this has a few peeling letters as pictured. Bottom of stick looks great and not as if it has been used and there is still light sticker residue around handle from tags. That being said I can not verify it is brand new so please view pictures and ask any questions you may have! We will ship same or next business day! Thanks for looking! Custom Ohio State Bauer Vapor 1X pro stock stick. Right handed, P106 (similar to PM9 retail), 82 Flex, 65 inches tall up against a wall (standard height, never cut). Stick is used but in excellent condition. Blade and shaft are not cracked or damaged, Some cosmetic blemishes, tape residue, small scrapes etc. Buyer pays $20.00 USPS Priority Mail shipping. Payment must be complete within 7 days of auction close. Pattern: P14. Handed: Left. Shaft Texture: Tacky. NEW Bauer Nexus 1N Composite Senior Hockey Stick Right Ovechkin P92 87 Flex Lie 6. Condition is New. Shipped with USPS Priority Mail. 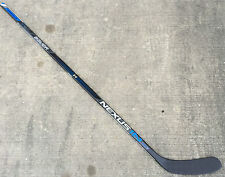 Pro Stock Bauer Nexus 1N2.0 P92 LH (82 And 87 Flex Available). Condition is New. Shipped with USPS Priority Mail. PRODUCT FEATURES:Model: 1042434. Bauer Vapor X Shift GripTac Senior-77 Composite Ice Hockey Stick, LEFT. Bauer Toews P14 - 77 FLEX - LIE 6 LFT 914 Length: 60" Shaft (Heel to Toe): 11". Bauer Vapor X Shift GripTac Ice Hockey Stick, LEFT. Bauer Vapor 1X Lite, Grip, Composite Hockey Stick. Right handed. Only used for two practices. Condition is like new, but top has been cut. See pictures for condition and top. Bauer Nexus 8000 Hockey Stick Right Handed. Condition is New. Shipped with USPS Priority Mail. Bauer 1x LITE (1N XL Build) Pro Stock Hockey Sticks. Right 87 Flex Grip Extended 64” heel to shaft P28 Curve 1N XL builds are Nexus 1N mid kick style ADV’s (Around 370g) Two total. Message if interested in both. Bauer TotalOne MX3 Composite Mini Stick. was nicely wrapped with tape. This was made possible because these two updates allow players to more easily load the vertical x-axis of the shaft rather that the just the horizontal y-axis of the stick. Stick is new condition but has multiple scuffing from handling on shaft and blade. Shaft Texture: Grip. Pattern: Custom (See Pic). Bauer Nexus 7000 Junior Sz 1.5. Condition is Used. Shipped with USPS Priority Mail. Bauer Supreme 1S Hockey Stick, Senior, Left, P88, Grip, 77 flex cut half inch off, used only twice. To finish off this new rounded feel this model will only be available in a nice Griptac finish. This year the N6000 features Bauer’s Sweet Spot Technology, an enlarged mid kick zone that Bauer has re-engineered to allow for more efficient loading and energy transfer in your shot. Stick length is about 57”. Ice Hockey Stick 52 Flex Grip Kane P88 51" RH #Z17 (YM) 242. Hockey stick. You will get what is shown on the pictures. Warrior has managed to knock a whopping 25 grams off of their previous stick models, including a 35% lighter blade! Stick is new condition but has minor scuffing from handling on shaft and blade. See pictures for more detail. Nexus n2700 intermediate 55 flex p88 left. brand new with stickers still on, however no warranty sticker. Bauer Nexus 2N Pro Left P88 Kane 65 Flex Intermediate Hockey Stick. Condition is New. Shipped with USPS Priority Mail. Bauer Pro Stock Composite Goal Stick New Evgeni Nabakov Custom Ergo Paddle for controlled rebounds Nice curve similar to P31 Great feel and weight Retail was over $200 Won’t last - steal of a deal!! Bauer Nexus 2N Pro, grip, Left handed, 95flex, p92 curve. Extended length, 1/4in taller blade at heal, grip with corner tactile grip. Condition is New, some still in original bag. I have 6 total. Shipped with USPS Priority Mail. It's available in a nice matte finish, or in the slightly different graphic of the Griptac finish. The NXG stick was designed to feel more like the One95 but with performance attributes of the TotalOne. A couple small scratches ont he blade, that's it. Flex 87, curve is a p92 with max blade height. Super light stick and great pop. Stick was made for Loui Eriksson of the Canucks. Specs are identical to Elias Pettersson except the flex is 87. Used maybe in 10 beer league games. Cut down one inch from factory. No significant dents or scratches. In excellent condition. This item is retail not pro stock. Measures 59.5 inches from the top of the stick to the bottom of the heel of the stick. This stick has no grip. 102 flex p92 ovechkin curve This stick has been cut from its original length but has never been used. Brand new condition. They are a P91 Max height blade with a toe kink. Bauer Supreme One 60 Jr Hockey Stick PM9 52 Flex Lie4 Stamkos Left Hand LH FAST!